Constantly evolving and gaining in sophis- tication, Grover Vineyards derives its sophisticated palate from 35 strains of French grapes that have been cherry-picked for wine production in India. It was Kanwal Grover, founder of Grover Vineyards, Kapil Grover, the current owner and Georges Vesselle, who took on the challenge of growing French grapes back home. Having taken on the task of establishing India as a destination for wine connoisseurs about 20 years ago, the Grover family has certainly come a long way even exporting their wines to France. Nestled in the romantic Nandi Hills on the outskirts of Bangalore since 1988 the idyllic location that also makes for a perfect weekend getaway was picked for its rich soil and temperate climate. Spread over 40 acres of the fecund landscape, the region was scrutinised by French oenologists to check for its suitability. Aimed at pleasing epicures they even got the ‘flying wine maker’ Michel Rolland to lend his expertise on the complex art of wine making. This fruitful communion has created exotic reds like La Réserve and Cabernet Shiraz, clear whites Sauvignon Blanc and Viognier Clairette and a rose wine from the Shiraz grape. Their young, fruity Santé offers affordable red (Santé Shiraz) and white (Santé Chenin Blanc) wines produced from high quality grapes from Maharashtra. And their passion for wine is so holistic they’ve even made strides in wine bottling developing the Stelvin Cap which prevents the musty odour that wines get when they come in contact with bacteria. 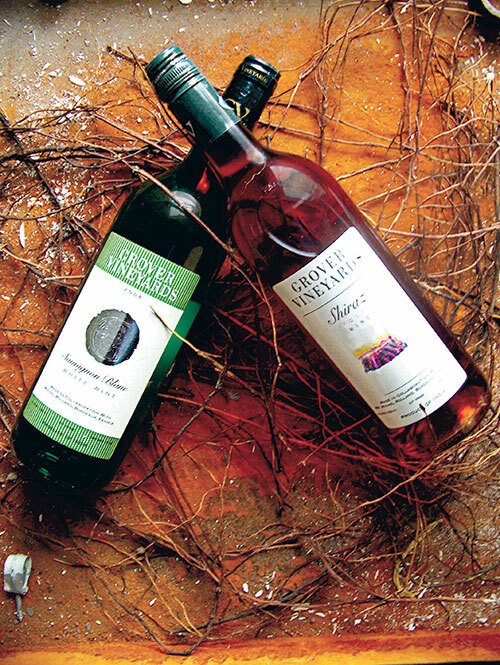 Unlike other brands, Grover doesn’t believe in flooding the market with new wines. Rather, it’s taking its time to help India develop an indigenous market and is aging much like fine wine.